A 12 Year Old Girl Presents With Abdominal Pain, Bloody Diarrhea And A Purpuric Rash. A 12 year old girl is admitted to the pediatric ward with a 2 day history of Lower abdominal pain and blood stained diarrhea. Three days later she began to complain of pain in her ankles and the right elbow. She also felt nauseous but there was no history of vomiting. On examination the patient looks sick, has a periorbital edema and a purpuric rash affecting the arms and the legs. She is afebrile but her BP is 150/95 mmHg. 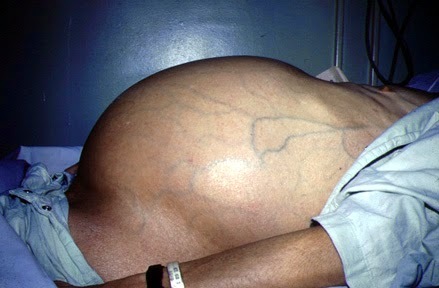 Based on the above history and investigations what is the most probable diagnosis? 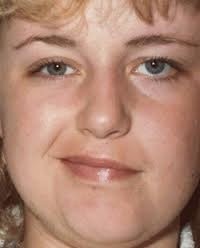 A 40 year old woman woke up in the morning and felt her left side of the face being peculiar and heavy. On looking in the mirror she saw that the corner of her mouth on the left side was drooping and her left lower eyelid seemed to be lower than her right. When she attempted to smile her left side of the face remained immobile and broad like. On eating her breakfast she felt the food to stick on the left side of her cheek. She was terrified and came to the emergency department for a checkup. On examination she has paralysis of the entire left side of her face. Diagnosis: Bell's Palsy ( Caused by a lesion of the left facial nerve that supply the muscles of facial expression). Bell's palsy is a paralysis or weakness of one side of the face caused by a damage to the facial nerve. The condition comes on suddenly usually overnight and fortunately gets better on its own over a few weeks. 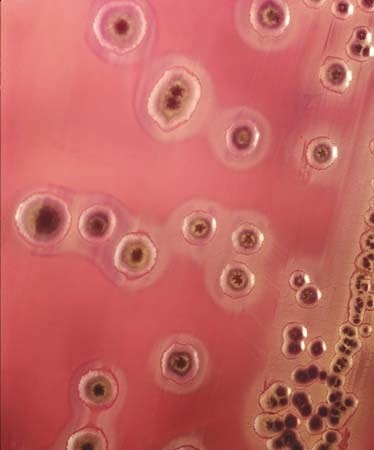 A 38 year old man presents with history of difficulty breathing and wheezing that has started about six weeks back, For 2 weeks he has also developed cough productive of yellow sputum and fever. There is no history of night sweats. 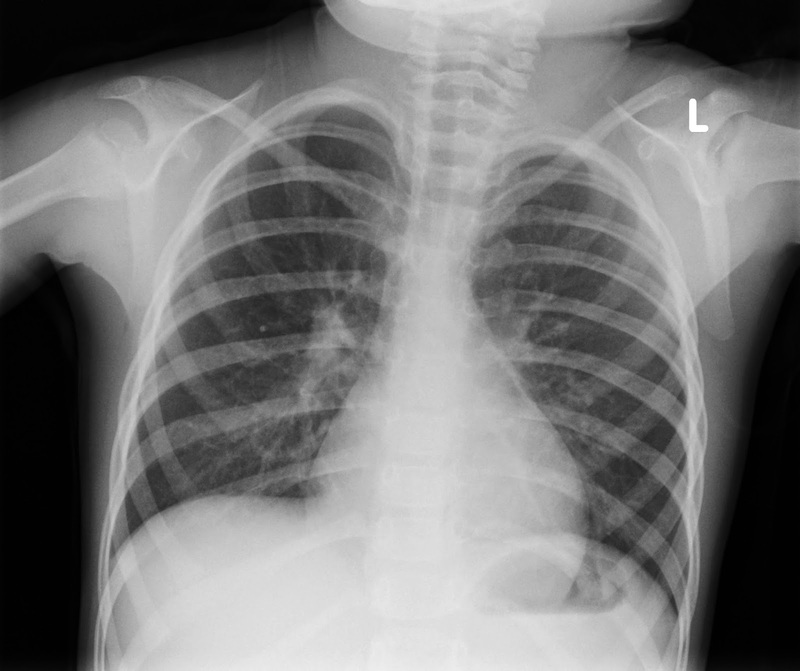 The patient has a past history of asthma and recurrent atopic symptoms. X ray findings show diffuse peri-hilar infiltrates. On blood workup there was an eosinophillia and the sputum culture was negative. Based on the above history and investigations for is the most likely diagnosis? A 68 year old woman who was diagnosed with rheumatoid arthritis about 20 years ago now presents with swollen ankles and edematous feet. 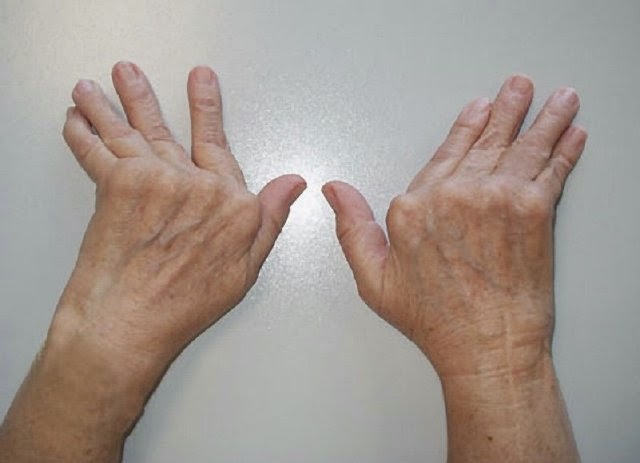 Her rheumatoid arthritis was relatively well controlled with non steroidal anti inflammatory drugs until six months ago when her symptoms of pain and swelling needed the addition of penicillamine. Patient also has a history of hypertension controlled with drugs. Her heart rate was 90 beats/min and irregular. Her blood pressure was 140/90 mm Hg. JVP was not raised and her heart sounds were normal and chest was clear on auscultation. On investigation urinalysis shows +++ proteinuria. 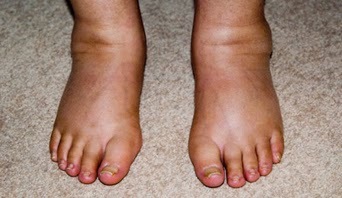 What is the cause of her edema and what will be the management?? A 20 year old college student comes to his physician concerned about his health because he feels chest pain and gets short of breath during exercise or sports. He also describes having episodes of feeling his heart beat very fast. He wanted to have workup done because his brother died suddenly at an age of 18 years while participating in his school sports event. On examination the patient is a healthy looking young man and there were no abnormalities detected on his chest examination. On Echocardiography there is septal hypertrophy with left ventricular outflow tract obstruction. Based on the ECG and the history of the patient what is the most probable diagnosis? A 16 Year Old Girl With A Past History Of Chemotherapy Presents With Breathlessness. 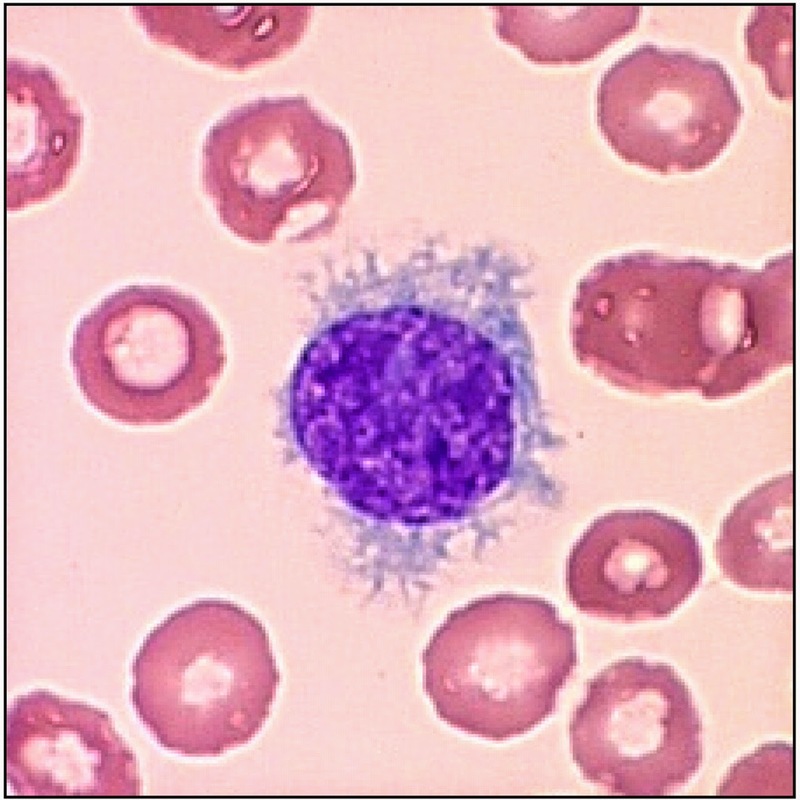 A 16 year old girl who had a past history of acute myeloid leukemia and was treated with six courses of chemotherapy presents to her doctor with the complain of Breathlessness on exertion. During her chemotherapy she was also given cyclophosphamide. On examination patient appears to be breathless even at rest and she looks cyanosed. There is no evidence of clubbing. Her lung function test shows FEV1/FVC ratio of 80%, but there is a decreased total lung capacity, indicating a restrictive pattern. 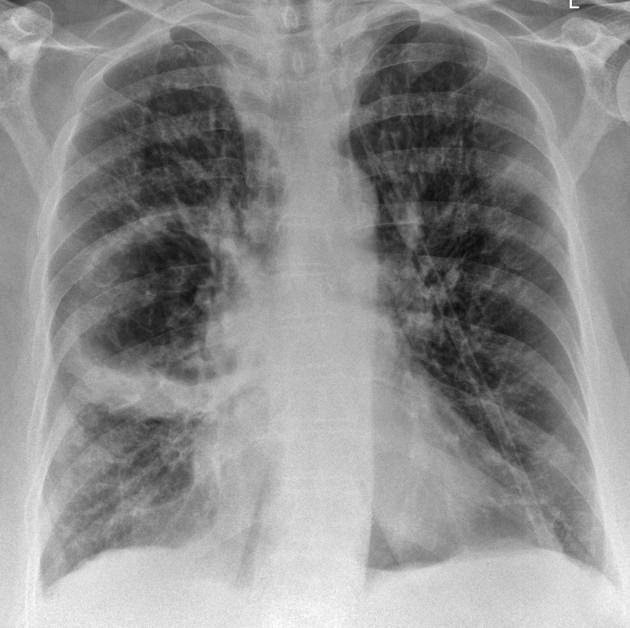 The X ray shows diffuse infiltrates indicative of interstitial lung disease. What is the cause of patient's symptoms in the above mentioned case? 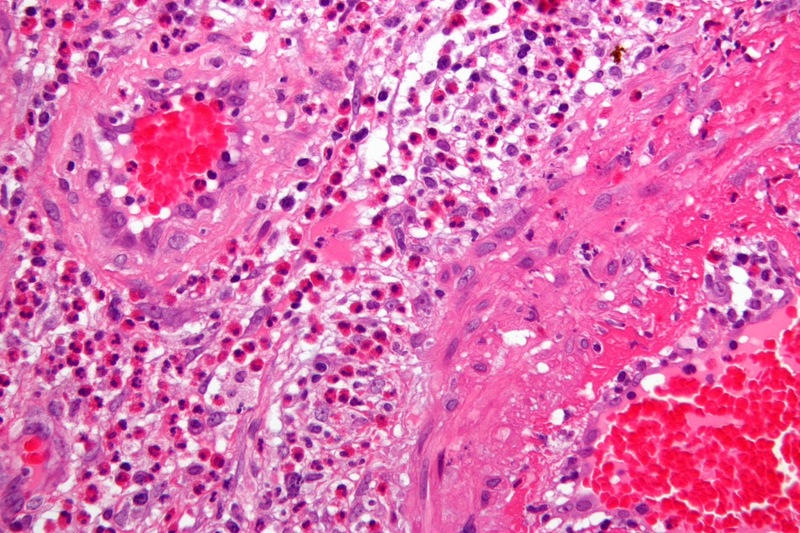 Answer: Cyclophosphamide induced lung fibrosis. Cyclophosphamide induced lung fibrosis is a relatively rare condition and is most likely to occur in patients who had concomitant pulmonary radiation or has taken other drugs that are toxic to the lungs. Patients may present several years after the cessation of treatment and with advanced damage to the lungs. The diagnosis is usually clinical from the history of exposure to the drug and from restrictive lung defect on pulmonary function test. The chest X ray shows reticulonodular shadowing more so in the upper zones. 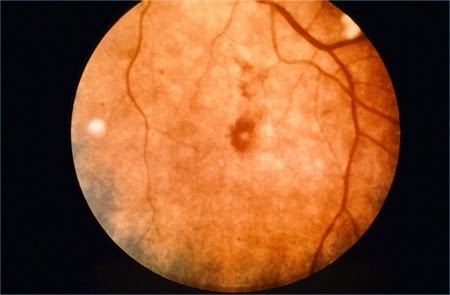 Churg- Strauss Syndrome which is also known as Eosinophillic granulomatosis is a rare autoimmune condition that affects small and medium sized arteries and veins. American College of Rheumatology proposed the following six criteria for the diagnosis of Churg- Strauss Syndrome. Central part showing an ill defined osteolytic area and major part consists of reactive sclerosis. 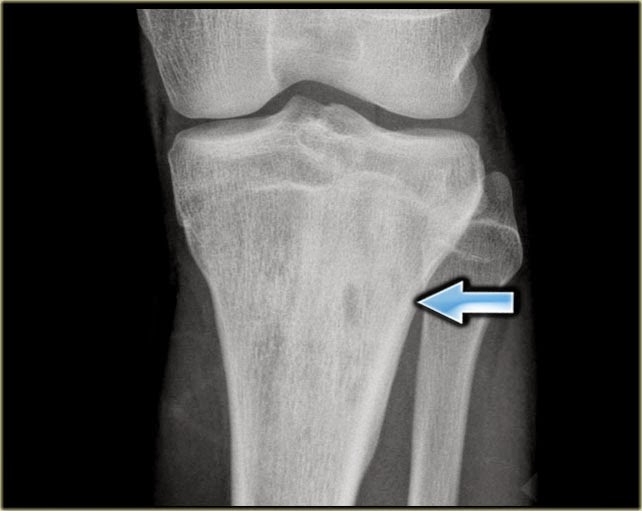 The patient was diagnosed to have Osteomyelitis. 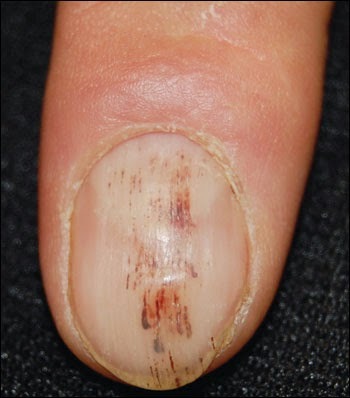 Osteomyelitis in adults almost always presents in patients with underlying diabetes, peripheral vascular disease or both with an ulcer or a soft tissue infection. Pain, swelling and warmth in the area of infection. A 40 year old man comes to his primary care physician because he himself as well as his friends and family have noticed changes in his facial features. Patient was recently diagnosed with diabetes mellitus and has also noticed that he sweats excessively. On examination the patient appears to be a tall man with prominent supra orbital ridges, ans a large lower jaw. His hands and feet appear to be large and his skin seems to be thickened and greasy. What other endocrine disorders a patient with acromegaly may have? A 7 Year old child who presented with high grade fever about 5 days back and is now on treatment for malaria now presents to the emergency with severe, sudden onset of pallor and dark colored urine. He feels very weak and is frightened by the appearance of his urine. Although he is afebrile now, he is breathing rapidly and on examination he looks pale and there is yellowish discoloration of his skin and sclera. On abdominal examination, spleen is enlarged and palpable. Numerous destroyed red blood cells ( Arrows shows bite cells following removal of Heinz bodies). 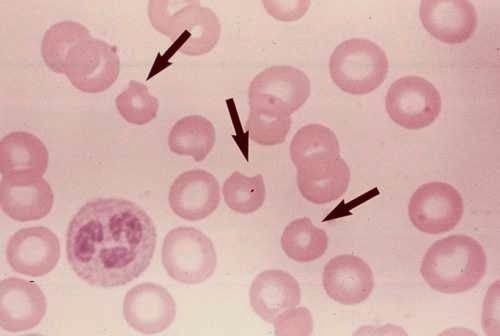 Hemolytic anemia due to G6PD deficiency, in this case hemolysis triggered due to antimalarial drugs. A 27 year old woman presents to her primary care physician with the complains of increased urinary frequency, pain and burning on urination as well as pain in the supra pubic area for the last 2 days. She also noticed that she had fever last night. She took acetaminophen which gave her temporary relief. Patient remembers having similar symptoms a few months back. She is sexually active with her husband. Her menstrual cycle is normal and regular. On Examination patient is febrile with a temperature of 101 F. On abdominal examination she feels discomfort on palpation in the supra pubic region. She is advised to get some lab workup done including a urine dipstick which revealed +ve nitrites and + leukocytes. Her urine is sent for culture which showed the following picture in the lab. Culture in the laboratory showing growth of Escherichia Coli. Patient is diagnosed as a case of Urinary tract infection. A 25 year old man comes to his primary care physician and complains of seeing blood in his stool occasionally. He has fairly regular and normal bowel habits but he is concerned because he has lost his father at a young age due to colon cancer and his initial symptoms were also blood in stool. He has no other symptoms and is living a healthy life style. The patient was referred for a colonoscopy which showed the following in the sigmoid colon. 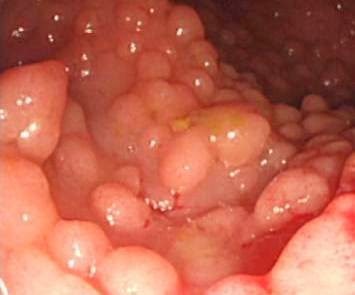 Multiple polyps carpeting the mucosa of the colon. Based on the history and the above picture what is the most probable diagnosis? What is the diagnosis on the basis of characteristic appearance on the ECG. Atrial Flutter is an abnormal heart rhythm and is one of the types of supraventricular tachycardia. It is similar to atrial fibrillation and sometimes both may occur one after the other. A 30 year old man presents to his primary care physician with the complains of severe abdominal pain, high grade fever and a bloody diarrhea that started 2 days ago. Initially the symptoms were mild but now he is feeling very sick and weak. He gives a history of passing more than 5 watery stools mixed with blood today. He has no history of vomiting but his appetite has decreased. He remembers eating at a road side restaurant while he was coming home from work. On examination he looks pale and mildly dehydrated. 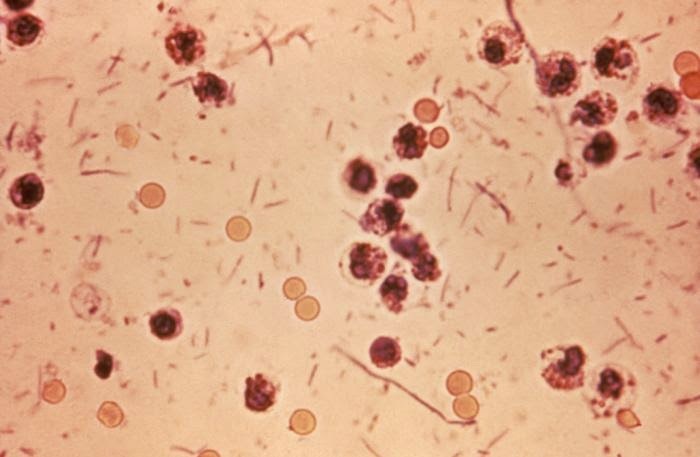 The above picture shows the shigella species under microscope in a stool specimen. A 50 year old man who has been sick for the past 5 years with fever, cough and fatigue and has been taking incomplete treatments from different primary care physicians presents with a cough, fever, weight loss, night sweats, extreme body weakness and pain through out the body. He was taking some cough syrups recently with no improvement in his symptoms. On Examination patient is a thin man with poor hygiene and signs of weight loss. He is anemic and has palpable lymph nodes in his neck and axilla. He is coughing most of the time during the examination. He has decreased breath sounds through out the lung filed and on abdominal examination the spleen is enlarged. Based on the above history and the X ray picture what is the most probable diagnosis? 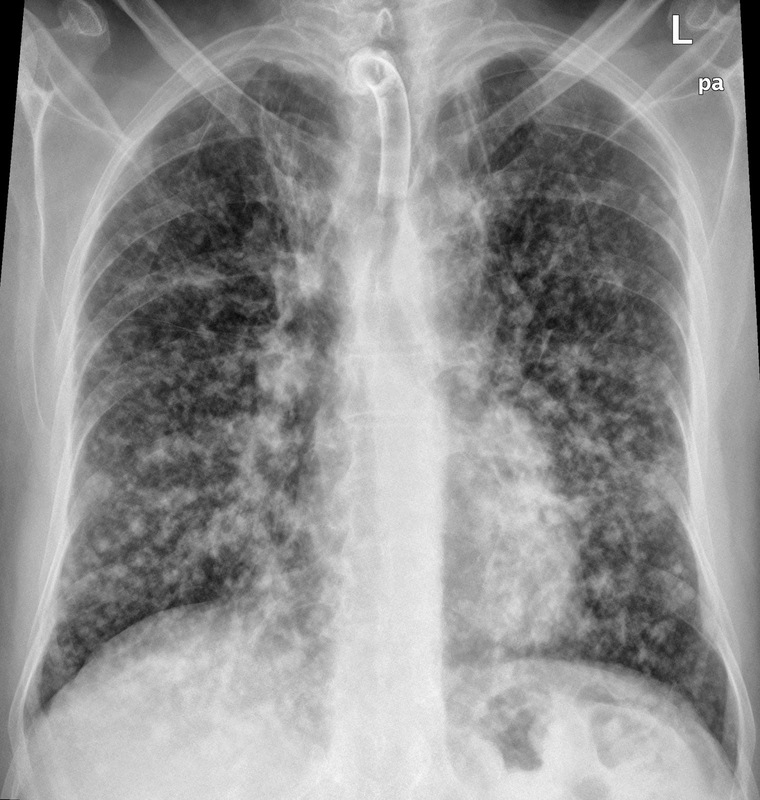 Miliary Tuberculosis is an uncommon manifestation of pulmonary tuberculosis and it represents hematogenous dissemination of uncontrolled tuberculous infection. A 60 year old man is referred to a pulmonary specialist with the complains of high grade fever with chills, a productive cough for about 4 weeks and a history of weight loss. The patient complains of a purulent sputum which is sometime streaked with blood and about a tablespoon full in quantity. His wife says that she has noticed a foul smell from his breath. 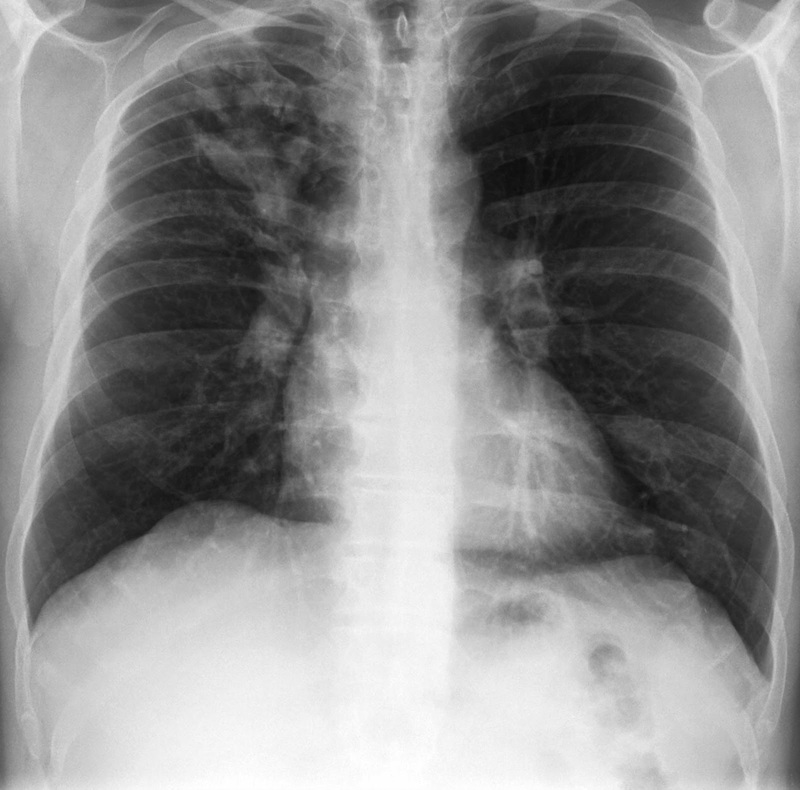 Chest x-ray demonstrates a large intrapulmonary cavity with an irregular air/fluid level interiorly. The wall of the cavity is ill-defined, ranging from very thin and smooth laterally to somewhat nodular superomedially. Lung abscess is defined as a cavitating area of localized , suppurative infection within the lung. A 35 year old man is having a physical examination as a requirement for job fitness. He is asked to do a pulmonary function test and blow through a spirometer. Spirometry is a powerful tool that helps measure the functional lung volumes and detect any underlying obstructive or restrictive lung disorders. 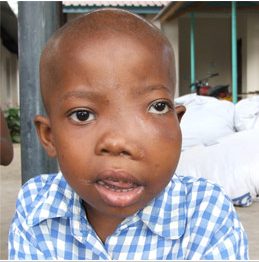 A 5 year old African child is referred to a Pediatrician for the presenting symptoms of a progressive painless swelling of the jaw that has not responded to antibiotic treatment and is growing rapidly leading to disfiguring of the face. The child has low grade fever for over 4 months and has also lost weight. He has lost his appetite and interest in daily activities. Blood workup shows Anemia and low platelet count. Serum LDH was markedly elevated and serum uric acid levels were also high. A biopsy was taken from the tumor and the case was diagnosed as Burkitt Lymphoma. Burkitt lymphoma is a form of non Hodgkin's lymphoma in which the cancer cells start in the immune cells known as B cells. A 3 year old boy is brought to the emergency department when he was seen to have a sudden choking while he was normal and playing with his toys. He has no history of any respiratory infection. A 45 year old man is brought to the doctor's office by his wife in a confused state, and complains of fatigue, weakness and pain under his right rib cage for the past several months. He is a drug abuser and has a history of jaundice in the past. His wife says he has been diagnosed with hepatitis C but they don't have any medical record with them. On examination the patient is acting strangely and is not able to give a proper history. He has anemia and a mild jaundice. His abdomen is distended, tender and firm with prominent veins at the umbilicus. Liver and spleen are both enlarged and palpable. Based on the given history in the above case what is the most likely case of the patient's abdominal distension? A 50 year old man presents to his primary care physician with complains of fatigue and recently noticed having bruises after minor trauma. Although he has never taken his temperature he feels that he has low grade fever on and off over the last few months. On Examination he was noticed to have an enlarged spleen and few bruises.